Recently we spoke to Tom Holoien, a Carnegie Fellow since 2017, about finding dying stars and his unusual path to becoming an astronomer. Q: What objects in space really capture your attention? A: I get excited by the violent deaths of stars—like supernova explosions and these things called tidal disruptive events, when stars get pulled apart by the gravitational forces of supermassive black holes. They are are some of the most-extreme events in the universe, where elements get created, and the energies push the boundaries of physics. Because of this, we can study physics on a fundamental level. Q: That sounds exciting! How do you find these bright flashes from dying stars? A: My main tool is the All-Sky Automated Survey for Supernovae (ASAS-SN) project. I was part of the founding ASAS-SN team when I was a graduate student at the Ohio State University. The team is led by two professors at OSU: Kris Stanek and Chris Kochanek. ASAS-SN now has 20 telescopes: Eight are in Chile, and four are in each of South Africa, Texas, and Hawaii. These are small, robotic telescopes that patrol the skies for transient events like supernovae, which appear as bright flashes of light that weren’t previously there. In less than a full night, we can observe the whole sky with ASAS-SN, and multiple locations in each hemisphere means there’s always something happening regardless of weather. I’ve helped develop the computer code that processes and sorts through all this data to automatically find these transients. To do this, we start by dividing the sky up into fields for observation. Each field has a "reference" image that is built from averaging many individual images—think of it as a high-quality "static" view of the field. When a new image is taken, the software pipeline subtracts the reference image from the new image, leaving us (ideally) with only dark or bright spots that are fainter or brighter in the new image than in the reference. Then a machine learning algorithm looks at each of these spots and notifies us of ones it thinks are "likely to be real.” There are certain portions of the sky that are interesting where we observe every night, and we also track currently ongoing interesting transients. The rest of the time we systematically map the rest of the sky. While ASAS-SN is great at finding new supernovae and other transients, we need other telescopes to take images and other data like spectra to confirm each detection. When we find something new, this triggers an alert, and we can follow-up using a range of telescopes to classify the object. We aim to classify almost everything we find. What’s also interesting about ASAS-SN is that the bright objects that we observe aren’t traditionally targeted by professional astronomers, who are often looking at fainter, more-distant objects. For a long time, amateurs would primarily discover these very bright supernovae because they were taking pictures of bright nearby galaxies. Kris Stanek, one of the founders of ASAS-SN, came up with this clever idea to create a network of these amateurs. Members of the network get the ASAS-SN alerts and, if they confirm a supernova, then they get their name listed first on the discovery Astronomers Telegram (aka ATel) that we send out announcing the discovery. Usually, we get a response from our network within a few hours of the alert. ASAS-SN now has a catalog of over 1,000 bright supernovae, brighter than 17th magnitude. This is less biased than previous bright supernova catalogs, because we’re monitoring the entire sky and not targeting specific areas. 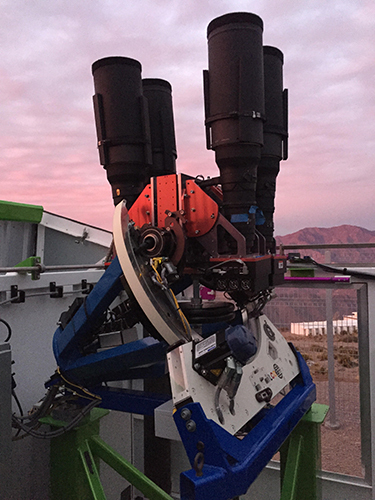 Additionally, since all these objects are bright, we can get useful data from 1-, 2-, and 6.5-meter telescopes—the whole complement of telescopes available at Carnegie’s Las Campanas Observatory (LCO). And since Carnegie has so much telescope time, I can usually find someone willing to do an observation when I have a new transient. The staff at LCO are really fantastic, helping us switch instruments, and people like Carnegie’s Nidia Morrell can jump in and do expert observations for us. Q: What’s one of your biggest discoveries or “ah ha!” moments? A: Tidal disruption events! 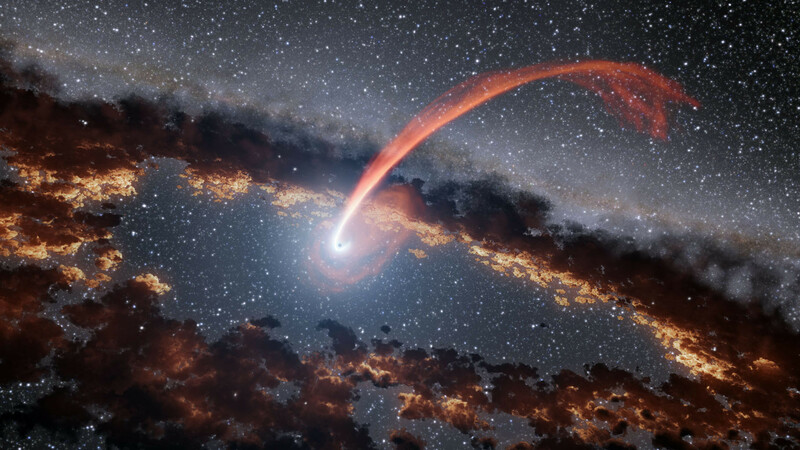 When a star gets too close to a black hole, the strong gravitational field can rip it apart, creating a flare as the stellar material falls onto the black hole. The first TDE that ASAS-SN found was in 2014, and I led that first discovery paper. Since then I’ve become the “go-to” TDE guy on the team. At that time, less than ten were considered well-observed probable TDEs, and since then, ASAS-SN has found five more. It’s been fun to have been part of a significant fraction all known tidal disruption events. It’s an exciting field because there are so many questions left to answer. For example, why don’t they all have X-ray components? Why are they cooler than we expected? Why aren’t we seeing as many as we expect? Theorists come up with new ways to explain the observations, then we find new objects to help them further refine the theory. Q: When did you realize you were interested in astronomy, and what path did you take to get here? A: My path here doesn’t travel on a straight line. I loved astronomy as a kid—my aunt and uncle would play planet guessing games with me, and my dad got us a telescope. I grew up in the Bay Area, but we could still use it to look at planets and nebulae. Then, at Stanford I started as a computer science major, but I ended up in East Asian studies. After studying abroad in Japan, I took an astronomy class for non-majors which rekindled my passion. After college, I worked for a few years at a tech company while my wife got her Ph.D. Eventually I decided I would like to get back to astronomy, so I got a second bachelor’s at Rutgers in astrophysics, which I really liked. While there, I did research for the first time in supernovae working on a team with one of the professors who won the Nobel Prize in 2011. I went to OSU, which was an awesome place for me for many reasons. I got in on ASAS-SN on the ground floor, and it was a great project for a graduate student because we’re discovering interesting things all the time. Q: What has the Carnegie Fellowship meant to you? A: The telescope access is unparalleled. I’ve gotten four to five nights on Magellan every semester since I’ve been here, as well as two nights a month on du Pont and access to a program on the Swope telescope with Carnegie collaborators. I’ve been using that time to classify new discoveries and observe the faint galaxies that host interesting transients. A lot of these little galaxies often don’t have data in the usual astronomical catalogs, and I’ve already observed about 30 of them. The travel budget for Carnegie Fellows is generous and critical for my research, as well as getting my own name out there. I have been able to go to large and small conferences, which keeps me up-to-date with the science and networking, in particular with the small tidal disruption event community. I can always say yes to these, which lets me spread my work and collaborate with people from other institutions. Q: Beyond your research, what else motivates you? 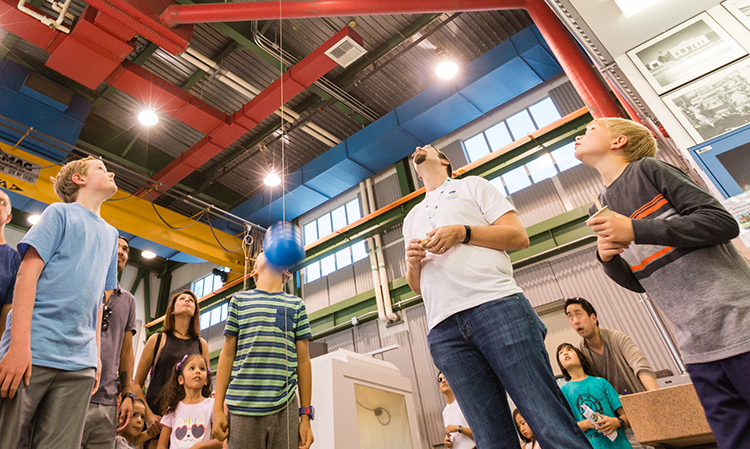 A: Encouraging a love of science in kids is something I really enjoy, especially because I used to be that kid. I enjoy talking to the public about astronomy, and how it has such a broad appeal. When I used to give shows at the OSU planetarium, there would be a huge range of questions, resulting in a lot of interesting conversations. Science and scientific understanding is such a benefit to society as a whole, and I want to spread that view as much as I can. I saw the total solar eclipse in Oregon, and it was so cool hearing everyone in the airport and stores talking about it. That whole event reminded me of those “wow, super-cool!” moments that I would have as a kid. It’s one of those moments where I step back and appreciate the awe of what we study.